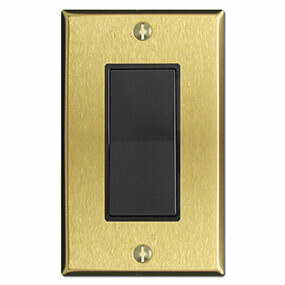 Gorgeous satin brass switchplates will add a cozy warmth to your home. With over 70 configurations ranging from traditional toggle light switch wallplates to modern Decora outlet covers in both standard and jumbo sizes, you'll easily create an environment that will be pleasing each and every time you walk into your room. 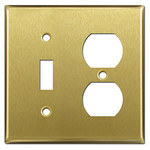 Should I replace my switches when I install these elegant switch plates? Not necessarily. Use the picture at left to get a feel for how these elegant brushed brass wallplates look with white, ivory and almond switches. 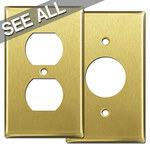 If you have either of these colors, your new brass wallplates will blend perfectly. The white is the least desirable as it offers the most contrast, but if you have white walls or white trim this could work well in your home. 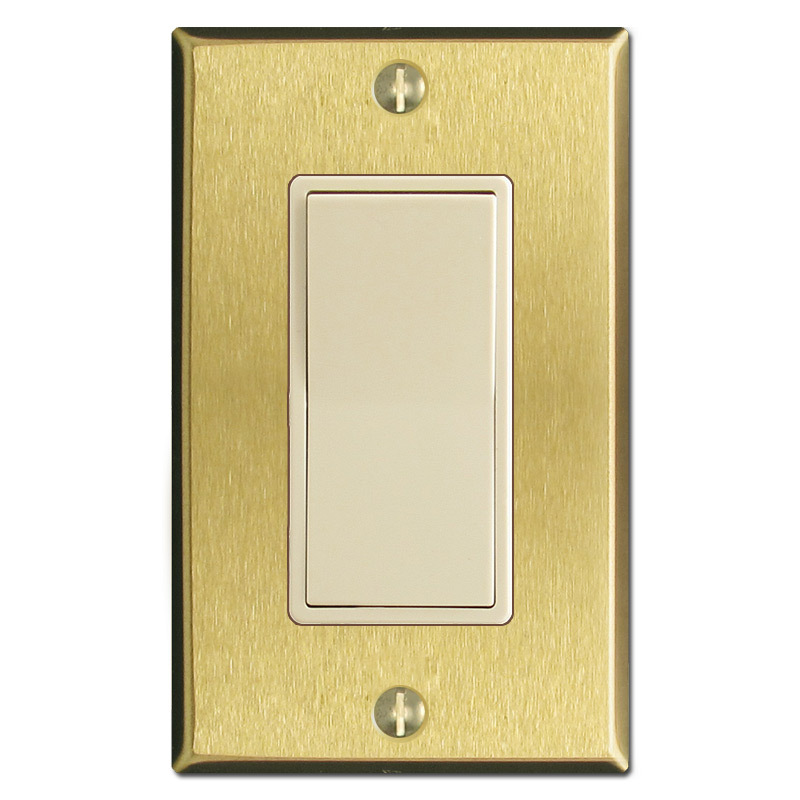 If your prefer less contast as shown with the ivory light switches and almond light switches, we recommend ordering these coordinating switches and outlets so you'll be happier with the finished look. 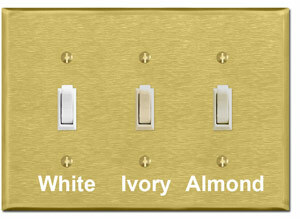 Think about your wall color and select what blends best. 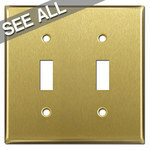 What is the finish on these satin brass electrical light switch plates? 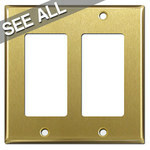 These classic decorative switchplates are made from heavy .040" solid brass, U.S. Bureau Standards Symbol #4. They have a brushed finish that is lacquered to help retard oxidation although they are likely to darken over time depending upon environmental factors. Clean with a soft cloth using dusting spray; avoid cleansers and chlorine as these will hasten the oxidizing process. 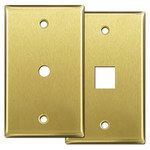 Which way are these satin brass switch plates sanded? 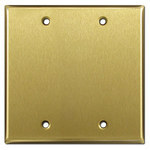 Single and double bronze gang plates are sanded vertically while larger plates are sanded horizontally. I plan on opening my vintage clothing boutique this summer and would like to stick with a retro look right down to my switch covers. Would brushed satin brass be a suitable choice if I want the store to look authentic? 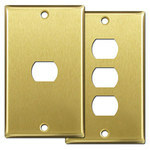 Brushed Satin Brass is a highly unique finish that goes very well with classic, antique and vintage decor. 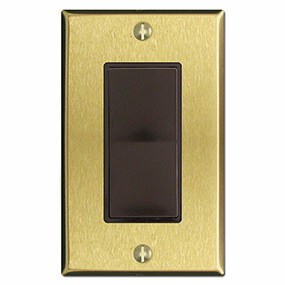 It is a more muted version of our polished brass switch cover and less reflective. As an antique collector, my entire home is filled with vintage accessories and antique furniture. Besides my dining room, where else would this finish look nice? 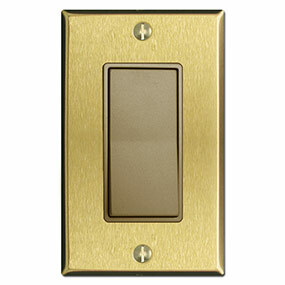 Our collection of brushed satin brass wall switchplates is always in high demand because of its gorgeous luster and similarity to antique switch plates. 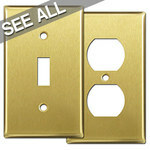 These coverplates are installed in bedrooms, bathrooms, kitchens, living rooms, bedrooms and laundry rooms in many period homes and blend in very nicely with antique furnishings. I'd like to make more of a statement with switchplate covers in my bed & breakfast and will be replacing all the cracked plastic ones. I know that these are made of metal, but would you recommend this finish for a Victorian house? Certainly. 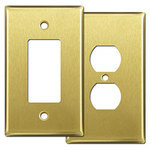 The brushed satin brass wallplates are an ideal choice for Victorian homes and many other residences which were built during the late 19th century. Many homeowners who are remodeling their Victorian homes turn to brushed satin brass or polished brass for an authentic and elegant feel. My husband is helping me remodel our bathroom and I have chosen a very beautiful paint color called Daffodil. 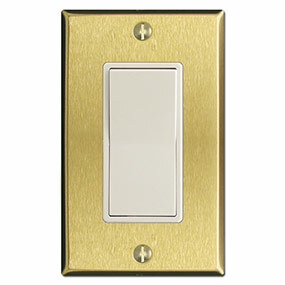 Is there any switch plate cover finish that you would recommend I purchase that matches my wall paint? Brushed brass is a popular choice for homeowners who have painted their walls in the yellow, beige or brown family because it enhances the wall color and makes the entire space look elegant. This finish is a great option for those who have painted their walls in a Jonquil, Classical Gold or June day colors which are very similar to your wall paint. My sister is working with an interior decorator on her new kitchen but they are going back and forth between two wall plate finishes. Her counter is made of Chariot Vanilla granite and I suggested your brushed brass finish. What finish do customers who have a yellow-ish counter top generally choose? Although each individual's style is unique, there are some trends when it comes to matching wall cover plates with kitchen counter tops. Usually, we recommend brushed brass to anyone who has a surface made from Golden Vinhal, Royal Gold or Honey granite because brass has a nice way or pulling all the warm yellows and rich golds out from the stone with very stunning results.